There will be 40,000 people running in the Berlin Marathon on 26th September 2010. World record holder Haile Gebrselassie is one of them, the MHF's Matt Maycock is another. Who needs your support? 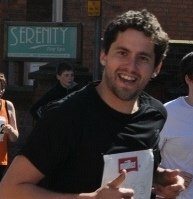 Yes, you can sponsor the MHF's development manager in his first ever marathon by clicking the button below. You can say that again, Matt. As regular visitors to the MHF websites will know, the MHF provides an independent and authoritative voice for male health in England and Wales and tackles the issues and inequalities affecting the health and well-being of men and boys. The charity’s vision is a future in which all boys and men in England and Wales have an equal opportunity to attain the highest possible level of health and well-being making it is the perfect charity to support someone doing their first marathon. Please give generously.